The president asked his former campaign manager to sign up with the vice president's team as the midterm elections heat up, according to a Republican source. WASHINGTON — President Donald Trump's first campaign manager, Corey Lewandowski, is going to work for Vice President Mike Pence's political action committee. "Proud to be joining the Great America PAC. @realDonaldTrump and @MikePenceVP continue to fulfill the Camapign (sic) Promises they made to Make America Great Again!" Lewandowski tweeted Monday. "The Rep's will expand majorities in the Senate and hold the House to keep America moving forward." 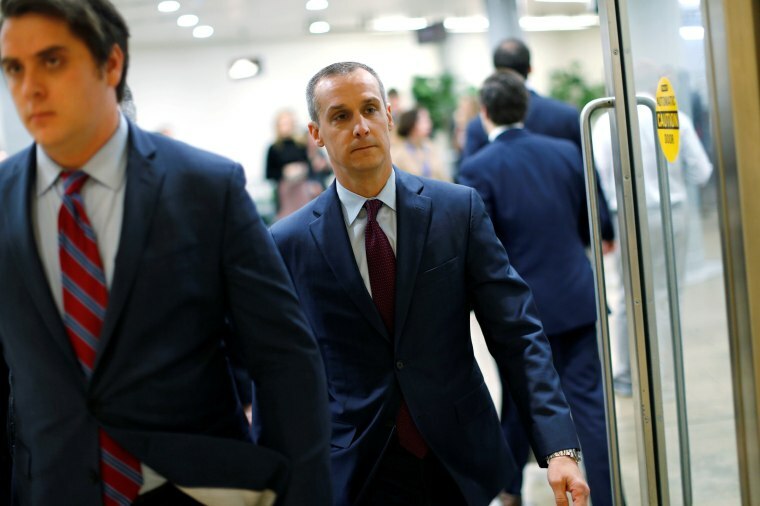 Lewandowski, who was fired partway through the 2016 presidential campaign, has remained close with Trump and appeared with the president at a political rally in the Detroit suburbs last month. The decision to bring in Lewandowski comes against the backdrop of a New York Times article that reported on tension between the president's team and the vice president's political aides over the emergence of Pence as a political force in his own right. It was Trump who asked Lewandowski to sign up with the vice president's team, according to a Republican source. Lewandowski's arrival sends a signal that, while Trump and Pence are aligned, Trump is the boss, said a second source, a GOP donor who had been informed of Lewandoski's plans. Pence has used his Great America Committee PAC, Protect the House — a joint fundraising operation with House Majority Leader Kevin McCarthy, R-Calif., and his role with the America First Policies nonprofit as vehicles to aid the president's re-election efforts and enhance his profile with both Republican officials and Trump's base voters. The Great America Committee has doled out more than $450,000 to Republican candidates and political committees in this election cycle. Lewandowski did not immediately respond to a request for comment. Fox News first reported the move. "In January, the president and the vice president developed a 2018 campaign strategy along with their senior staff and congressional leadership at Camp David," said a statement from Alyssa Farah, Pence press secretary. "Since then, we have worked with party committees and in close coordination with the White House political team to execute that plan. The vice president's political and fundraising travel advances the president's agenda by aiding targeted candidates and committees during the midterms, which is what the president asked us to do. Our team works hand-in-hand with our colleagues and have tremendous respect for the work they do."